I have never been to Morocco but we came really close in 1999 when my husband and I traveled to Spain and to Gilbraltar. High atop the Rock of Gilbraltar you can see the coast of Africa and Morocco. We discussed going but then we would of had to rearrange our itinerary and would of missed traveling to several cities in southern Spain. Looking back, it's unfortunate that we didn't go since it was so close and would of been a short ferry ride or plane flight. Oh well, hopefully one day we'll go back and make Morocco a definite stop on our itinerary. 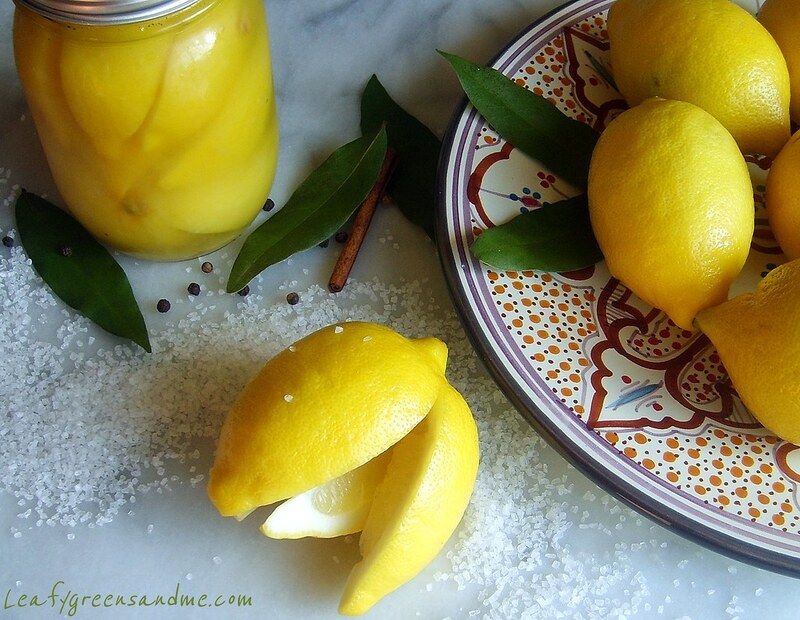 Until then, I love making and eating Moroccan cuisine (vegetable tagines/stews that are spicy, sweet and savory, and couscous flavored with nuts and dried fruits), but you can't make Moroccan cuisine without using preserved lemons. I've purchased preserved lemons at Whole Foods or other specialty markets but they just don't taste the same as making your own. And they're really easy to make. You just need to plan accordingly because they take about a month to preserve but will last up to six months. Preserved lemons are pickled in salt and they are one of the most common ingredients (condiment) used in Moroccan cooking. Normally, only the peel of the preserved lemon is used in cooking and the pulp or flesh is discarded. I always make a small batch using 3-4 lemons, which seems to work well for the amount of Moroccan dishes I make. Sterilize the mason jar and lid before using. Wash and dry lemons and cut into quarters, but leave the lemon quarters attached at the stem. Coat the inside of the lemons liberally with sea salt and press the lemon closed. Press the lemons tightly together in the jar and and cover entirely with lemon juice. Store in a cool, dry place shaking the jar every day for three-four weeks. To use, scoop out and discard pulp and rinse the lemon peel under water to remove any remaining salt. Chop, dice or mince and use in your favorite Moroccan recipe. Never made moroccan food but i love preserving/ pickling things! Are you going to be posting some yummy recipes using this soon? If so I am down! Yes, I will be posting several Moroccan entrees in December once we get past Thanksgiving. I don't know why but I always associate Moroccan cuisine with winter months. Makes no sense actually considering their geographic location. I guess it has to do with all the tagines and stews they use in their cooking. But yes, I will be using the preserved lemons shortly.